When Starbucks rolls out its iconic red Holiday cup, you know the season is upon you. But who wants to be like everyone else, running around with the same cup (or cup sleeve)? Not me. So I whipped up this baby the other night when my friend N came over for a potluck dinner (she made the best homemade pizza) and some crafting. cute!!! I almost bought that cup but it was sooooo heavy! add to it that I drink iced lattes even in the winter and it didn't make much sense. 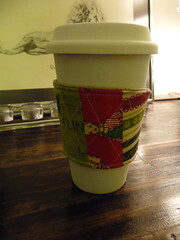 I do love their other cup that looks like the plastic one though and use a cozy for it!